Your president may be at least partially correct: Digital First Media, which mismanages more than 50 daily newspapers in the United States, could, with only a pinch of hyperbole, be termed the enemy of the American people. DFM, the media company that’s controlled by the vulture-capital scavenger firm Alden Global Capital, is infamous for its elegantly simple financial philosophy: Buy struggling newspapers (and it’s a small number that aren’t struggling), and, rather than improve them, wrench every last suffering dollar out of them through layoffs and cutbacks until all that’s left is a ghost of a newspaper that once faithfully covered its community’s politics, schools, sports and events. Now, DFM has its eye on a potential takeover of the newspapers owned by Gannett, which would be tragic for cities and communities served by a Gannett-owned newspaper. Long Beachers know, because it happened in our town to the Press-Telegram, which became part of DFM in 2011. And, in 2016, DFM purchased the Orange County Register and Riverside Press-Enterprise and formed the Southern California News Group. Today, the 11 SCNG papers, including the L.A. Daily News, the Orange County Register and the San Bernardino Sun, share content in order to save a lot of money and significantly boost DFM’s profits, little if any of which was reinvested in its news properties. And the shared content and editorials satisfy none of its readers, with so many features and opinions from other cities and insufficient staffs at the individual papers to adequately cover their own towns. DFM’s acquisition and subsequent operation of the Press-Telegram was the main factor in my decision to leave the Press-Telegram and join the Long Beach Post in 2018 after 42 years. Joining in the exodus from that paper was its city editor, Melissa Evans, its public safety writer Jeremiah Dobruck, photographer Thomas Cordova, and advertising manager Andrea Estrada, plus SCNG’s Orange County Register’s criminal justice reporter Kelly Puente and Daily Breeze reporter Valerie Osier. The purchase of your home town’s (or home state’s, for that matter) newspaper by DFM does real damage to residents’ awareness of what is actually going on in the community and it renders once-robust newspapers into little more than newsletters reposting press releases. Besides crippling Southern California news coverage by ravaging the staffs of nearly a dozen newspapers, DFM has similarly decimated news staffs in Northern California, where the once-booming San Jose Mercury News and a number of community papers have been savaged by cuts and layoffs. Similarly, look to the wreckage of the Denver Post after DFM got control of Colorado’s leading publication. There are no examples of anything good coming out of DFM’s acquisition of a newspaper, and the specter of the company buying a newspaper rightfully causes fear and anxiety among that paper’s staff. So, it is incumbent upon the residents and businesses of cities served by Gannett (which is not without its own faults, but they don’t approach the disasters wrought by DFM) do everything in their power to prevent DFM from invading their community. Say no, Tennessee, to losing the Tennessean, which serves your entire state. Say no, Iowans, to the potential decimation of the Des Moines Register, one of America’s most important newspapers. Say no, readers of the Detroit Free Press, the Indianapolis Star, the Arizona Republic, the Milwaukee Journal-Sentinel, the El Paso Times, the Cincinnati Enquirer, Rochester’s Democrat & Chronicle. For that matter, say no, if you’re a reader of USA Today, although perhaps not quite so passionately. 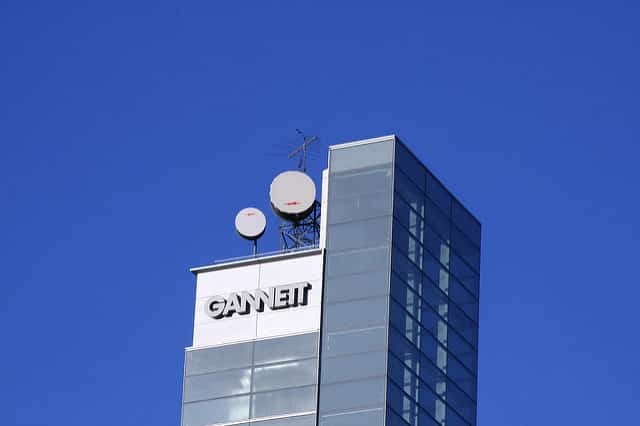 In all, Gannett now owns at least 15 of the country’s top 100 local papers, and if DFM manages to acquire Gannett, those papers will fall out of the ranking altogether. Don’t allow this to happen in your town.